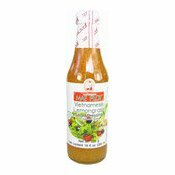 Direction: This Lemongrass Salad Dressing is wonderful in mixed vegetable salad. Shake well before use. Storage: Keep in a cool dry place. Refrigerate after opening. Ingredients: Water (41.0%), Sugar (21.0%), 10% Distilled Vinegar (Cane Sugar) (17%), High Fructose Syrup (12.0%), Lemongrass (4.8%), Salt (2.2%), Pickled Red Chilli (1.0%), Red Chilli (0.7%), Stabiliser (Xanthan Gum) (E415) (0.3%).